Chilliwack – MARCH 21, 2018 UPDATE – At Tuesday evening’s council meeting, Chilliwack City Council had no problems granting heritage status to Skelton House. The unanimous decision was music to the ears of Laura Lee Allen and her crew at Heritage Chilliwack, who supported the home owners bid for the designation. Skelton House along with Brett House, Waring House, Fire Hall Number 1 and the Royal Hotel will all be part of the 2018 Home Tour, with tickets going on sale August 1. The Home Tour is Saturday September 29th from 1-5PM. 150 tickets will be available at $25 each. ORIGINAL STORY – OCTOBER 10, 2017 – Heritage Designation is in the works for a prominent Chilliwack home. 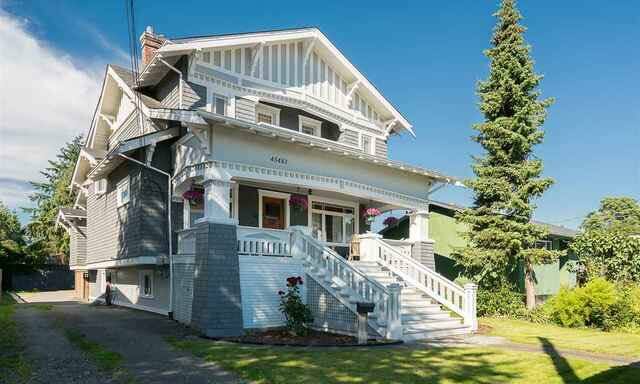 The new owners of the Skelton House have applied to the City of Chilliwack for voluntary heritage designation on their Spadina Avenue home, opposite the old fairgrounds. Once the process is complete the Skelton House will increase the number of Heritage Designated sites in Chilliwack to 14. Heritage Chilliwack supports the effort. Completed in 1914 the large craftsman home is one hundred and three years old and was built for the first residents, Robert G. and Susan Skelton and their young family. The large residence displays the typical features of a craftsman style home; from the generous full width front porch, inset second floor balcony, exposed rafters and decorative braces under gables; tapered porch columns and wood shingle siding. The grand home originally sat on a parcel of 2-1/2 acres of land purchased from Chilliwack pioneer Isaac Kipp in 1913. Tax records indicate a barn was completed on the property before the home was built. In 1926 Robert Skelton opened his men’s wear business at 45957 Wellington Avenue in downtown Chilliwack. Fire destroyed the building in March 1930 when a spectacular fire ripped through the commercial district, razing a large portion of the downtown core. The building was quickly re-constructed on the same site and beautiful multi-coloured mosaic tiles on the front and entranceway of the building is included in the design. Today these tiles can still be seen on the Wellington Avenue store front; taken over in 1966 by Gord-Ray Men’s Wear and still in business today. The Skeletons were active in the community. Susan Skelton was a well-known gardener and participant in the Chilliwack Fair; winning ribbons for her preserves and handicrafts. The Skelton family also was involved with both the Methodist and United Churches in Chilliwack. If you want more information on Sketon House or Heritage designations in Chilliwack, contact Laura Reid at heritagechilliwack@gmail.com or call 604-828- 5286. Be the first to comment on "Heritage Chilliwack Supports Heritage Designation To Skelton House"